Signature Arts, Inc.: Authentication Stickers Affixed by Morons? Much has been said about affixing unsightly self-advertising autograph authentication stickers to autographed material. Nothing said about it is positive. One of our last articles had someone who is a member of one of the high profile companies that claim to authenticate autographs returning an autographed photograph because it had one of these stickers affixed to it. The company he is listed as an authenticator places these type stickers on original autographed items. No one to date has come to us advising how these horrific stickers can be removed form an autograph without damaging the original item. Many collectors would like to know? This sticker fiasco begs the question of all our readers. PSA/DNA has added this sticker to the original 1930's card and basically has ruined the originality of the 80 year old collectible card. What happens if some person wanted to submit the card to PSA/DNA for grading? Maybe, they'll just grade the front of the card! 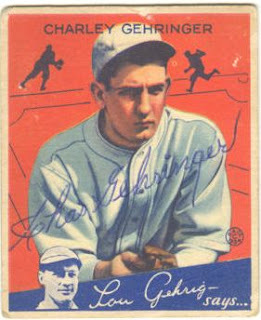 From their new 2009 Goudey baseball product, they have inserted original Goudey cards that were autographed. 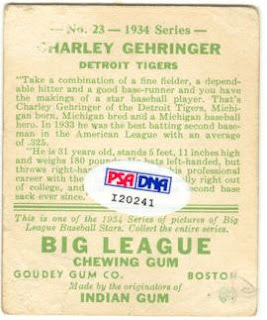 As you can see, PSA/DNA has attached their sticker to an original 1934 Goudey card. What a bunch of morons!